Pre-built taxonomies and automatic tagging are powerful add-ons for Microsoft SharePoint 2010 and SharePoint online. Read why you should not start a SharePoint 2010 project without taxonomy. Many companies are running project management documents in their ECM or document management system, including SharePoint 2010. Just like any other documents, these need to be tagged with relevant metadata so that project managers can have effective search, stay organized, and stay productive. WAND has created a taxonomy just for this purpose. 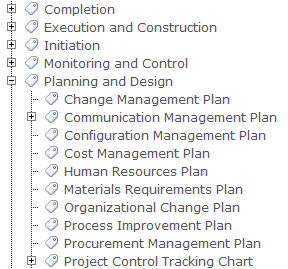 The WAND Project Management Taxonomy contains 135 categories with 63 synonyms covering project initiation, planning and design, execution and construction, monitoring and control, and completion. These terms include all of the important documents that are created in the course of managing a project. By tagging documents with this project management vocabulary as they are checked into a document management system, they can easily be found later. Combine these with a taxonomy of project names, and multiple sets of project management documents can be stored in the same place and easily be navigated by document type and project name. Want to automatically tag project management documents? Click the link to find out how.